enabling you to teach and share the magic of Yoga Nidra with your students. The course is designed to provide a foundation for teaching Yoga Nidra skillfully, with compassion and awareness. The transformative benefits of this powerful practice will amaze you and your students. This immersive 4 Day 50 Hour course will provide you with a clear understanding of the beautiful, healing power of Yoga Nidra, so that you can deepen your own practice, or share and empower your students. For RYT, Yoga Alliance counts this course as 50 hours Continuing Education credits. At the heart of The Village Nusa Lembongan is a community filled with passion and creativity – for surfing, yoga, diving, food, health and well-being… or simply living in an authentic heart-connected way. Along with Yoga Classes and Yoga Teacher Trainings, our Yoga Shala is home to regular meditation and kirtan sessions, retreats and special workshops to empower you to tap into the happy, creative and fulfilled individual you were always meant to be. Allow your heart to soar, your senses to shine and your soul to connect to the ocean and the magic of this small island community. Why Choose Nusa Lembongan For Your Yoga Teacher Training? The surf on Nusa Lembongan is a surfers’ dream and you can literally leave our shala and walk a few short steps into clean turquoise waters. You can even fit in a quick surf or SUP between classes. The accommodation we recommend is all within 1 – 10 minutes walking, which means you do not need to drive or hire a bike – giving you far more time to enjoy and relax. As there are no private cars on the island, paradise is not marred by traffic jams, dirty air or noise pollution – so you can unwind, de-stress and rejuvenate in a quiet and pristine environment away from the pressures of the busy modern world. Our Shala is directly in front of the clear aqua ocean, with gentle ocean breezes sifting through continually, making it a perfect backdrop for a restorative Yoga Nidra practice. 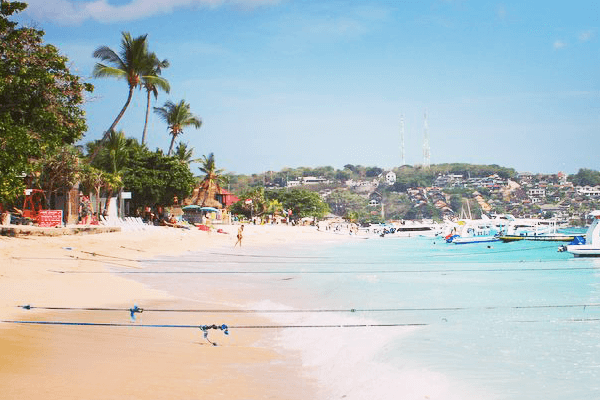 At first you may think of the total investment of getting to Bali out of your budget, however the reality is that life on the island is cheap – far cheaper than any other options on the market. Most students find the cost to complete our Yoga Immersives extremely inexpensive and affordable. Nusa Lembongan is uncrowded and sparsely populated – giving the place a real tropical island vibe. Life moves at a slow pace and you feel completely at peace when you reach her shores. A calmer pace means compared to other locations in Bali an exotic yoga getaway here is inexpensive and accessible. The island offers so much – world-class diving/ snorkeling, free-diving, excellent surf breaks, SUP and SUP yoga in crystal clear waters and beautiful beaches to swim or just soak up the famous Nusa Lembongan sunsets from a cosy bean-bag. Our on-site cafe ensures not only your mind and heart will be nourished with enriching goodness – so will your belly! We cater to all needs with a selection of wholesome and delicious meals and snacks, all made with the most important ingredient of all… love. If you have always dreamed of a life of tranquility and freedom, surrounded by clear aqua waters and the peaceful vibes of a true yoga community – then you will soon find Nusa Lembongan is the perfect yoga teacher training destination for you. Costs are for your training only, and do not include flights, meals or accommodation. Please see Accommodation Guide for options starting from as little as $25 AUD per night.